When Jean Muteba Rahier teaches his African Civilizations course, he already knows the common stereotypes he will have to break down throughout the semester. Africa is more than a continent of desert, safaris and poverty. It is a continent of historic civilizations and modern metropolitan cities. And in the 21st century, it is a continent poised for phenomenal economic and academic growth. Jean Muteba Rahier, director of the African and African Diaspora Studies Program and professor of anthropology in the Department of Global and Sociocultural Studies. The anthropology professor’s mission is to help impart knowledge on the realities of African society. A member of the African diaspora himself, Rahier was born in the Democratic Republic of Congo and educated in Belgium and France. 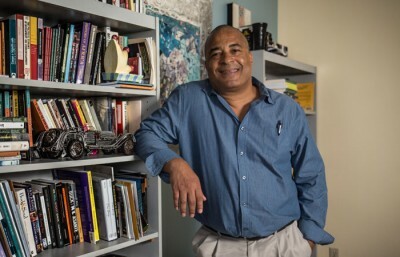 His interests in the African diaspora in Latin America led him to conduct extensive research on Afro-Ecuadorian communities and teach at the Catholic University of Ecuador. Looking for an institution that encouraged innovation in academic programming, Rahier came to FIU in 1998. He created the first master’s degree in African studies. And in 2008, Rahier was named director of the African and African Diaspora Studies Program in the Steven J. Green School of International and Public Affairs. The program features a robust curriculum, cutting-edge research, outreach programs and a life-changing study abroad program in Senegal and The Gambia. Its signature event is the Eric Williams Memorial Lecture, which focuses on Caribbean political and diaspora-related issues. In 2014, St. Lucia Prime Minister Kenny Davis Anthony delivered the 16th annual lecture, focusing on the Caribbean people’s stance on slave trade reparations. African and African Diaspora Studies also hosts the annual Chris Gray Memorial Lecture, which welcomed Hanna Forster, executive director of the African Centre for Democracy and Human Rights Studies, to campus this year to discuss gender equality in Africa. Under Rahier’s leadership, FIU recently entered into a collaborative agreement with the Universidad Andina Simon Bolivar in Ecuador to develop joint programs in African diaspora studies and Latin American cultural studies. And back on campus, the program welcomed 25 African scholars to FIU as part of President Obama’s Young African Leaders Initiative to empower young leaders through academic coursework, mentoring and networking. Through his knowledge, passion and determination, Rahier has broadened the conversation about Africa and its diaspora through education and outreach. These efforts were recently recognized by the U.S. Department of State, which awarded FIU a $187,000 Title VI grant to further the program’s initiatives. Those funds will be used to develop courses in Wolof and Swahili as well as other academic offerings and expanded library collections. I am very happy for the notes written about professor Rahier. He is not just a professor, he is a very solid scholar. Since, I have been one of the few Grad. students from COE to be in his class of Social Anthropology as a student, I can certainty qualify to make this comment about him.